This entry was posted in Birds (鳥), Photography (写真) and tagged オシドリのヒナ, ヒナ, baby ducks, birds, ducklings, ducks, 鳥, photography, 写真, 幼鳥 by T Ibara Photo. Bookmark the permalink. That is a cutie, thanks Takami. Very artistic photo. I love it. Happy new week. the eyes, stance, expression, i had say anticipation, yes, anticipation. with your tender loving care, ibara-san, no problem. i am sorry i have not published photos from the last japan trip yet, hope to have some out soon. i did work on one which i liked a lot and entered it for a competition, have a look at it here … http://yourshot.nationalgeographic.com/photos/8293414/ , feel free to comment, be it – or +, thks. regards, ken. thank you, ibara-san, japan is just gorgeous, which helps :). tried to look up your entries in natgeo but could not find any, what name/id do you use for natgeo? regards, ken. That´s why mother told me…. Just wonderful! Sensitive and beautiful. Thank you Takami! That’s a wonderful blessing. Peace to you and yours. Wow, she’s wonderful your photo. I wish you a beautiful Friday. I think being fearful is in the nature! Looking at his eyes, I see trepidation but also hope that one day he will be up and flying 🙂 You’ve captured his thoughts right there 🙂 Have a great day Takami. That’s a wonderful photo! 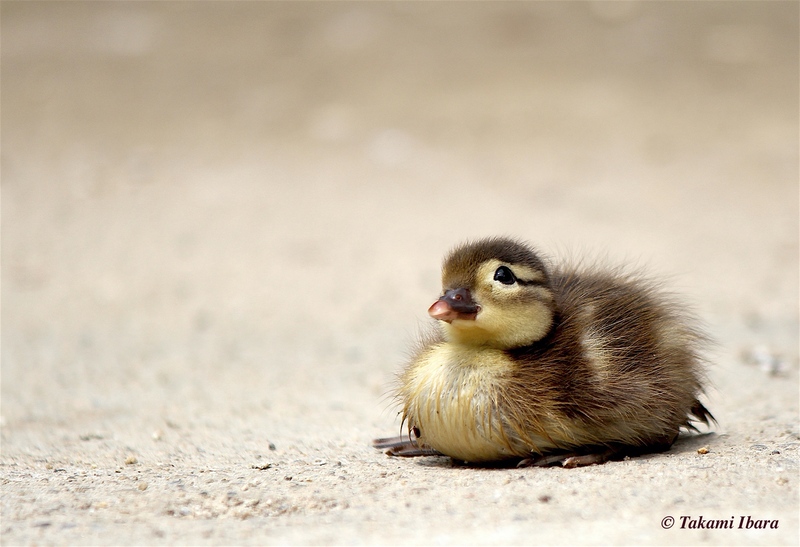 Adorable duckling! I think it’s trepidation. Poor thing is staying in place but it might not be the safest decision. Yes, the expressions are so multi-layered and complex, it’s almost impossible to know what’s truly going on in their minds. Fortunately for this duckling, Mama Duck was not too far away. What a sweetheart. Another great shot Takami. I hope you are having a great summer. Thank you friend. I love his expression. Our summer is turning out to be rather hot and muggy. Our summer, after a couple days of a false start, went right back into winter, complete with cold temperatures and steady rain. The forecast says we’re in for hot weather beginning on Sunday, but with July about to begin, people really aren’t holding their breaths waiting any longer. If it comes it comes (so much for the much-vaunted “global warming”). Lol. I’m sure it will get here soon enough. Too cute for words, Takami. You took a great photo! This image is so nice and lovely! The bokeh is perfect. So glad you could stop by. I love ducklings (who doesn’t?) and this little brought a ray of sunshine during the rainy season 🙂 Thank you, as always, for your nice comment. Dear me, what a cutie! Great job, Takami! Thank you! All “kids” are cute, and I loved his expression.